At a time when many non-fiction publishers are struggling to maintain sales of reference books in the face of competition from the internet, it is heartening to see one publisher meeting the challenge head on. Anyone who has tried to look something up quickly on the web knows that it can be frustratingly time-consuming, the sheer quantity of sites quite overwhelming and the quality of information often questionable. Hopefully books such as Usborne's new encyclopedia of geography will help to redress the balance by directing children to useful and reliable websites that can be explored alongside the written page. A first-rate reference book in its own right, the publisher is keen to stress that the book can be used without access to a computer. Its value is very definitely enhanced however when you log on to the 'quicklink site' that provides access to recommended websites. The best of these include video clips of volcanoes exploding or hurricanes in action, and there are particularly useful animated diagrams that demonstrate how the Earth orbits the Sun or the changing of the seasons. Others offer the opportunity to put questions to a marine scientist or to visit a virtual underground cave system. Usborne promises that the link site will be regularly maintained and updated. An additional benefit is that many of the images in the book can be downloaded and printed out for homework projects. The book itself provides good coverage of the physical geography of the Earth, the formation of rocks and minerals, rivers, lakes and mountains. There is generous use of photographs throughout, from satellite images of the Earth to dramatic shots of landscape features as well as marvellous close-ups of people and faces like the beautiful Masai girl or a group of young Buddhist monks. Coverage of the human geography of each continent inevitably skates over the surface, and Western Europe receives a mere two pages and a rather limited choice of websites, although there are useful sections on the EU, as well as general features on farming, industry and population. 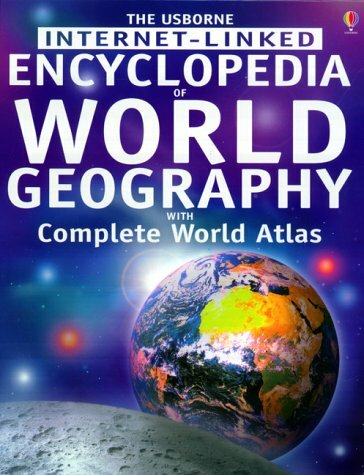 A 60-page world atlas and gazetteer completes the volume, together with a factfile of useful statistics. One hopes that Usborne might use the website to include any updates here too. Altogether an approachable and attractive reference book with a wealth of useful websites that can be recommended for home or school use.